A world-leading manufacturer of protective covers for aircraft which counts many of the world’s defence forces amongst its clients, credits moving to North Wales as contributing to its success. Air Covers relocated to Wrexham in 2014 and exports over 80 per cent of its products. It is the main supplier for the Royal Swedish Air Force, the Omani and UAE Air Forces, the German Bundeswehr, the Royal Navy and the Royal Air Force amongst others. Based on the Bryn Business Centre on Wrexham Industrial Estate, Air Covers employs nine full time designers and machinists and has taken part in various trade shows organised by the Welsh Government. It will be one of many Welsh companies taking part in the Welsh Government’s Export Market visit to China and Hong Kong in March this year. Helicopters are vulnerable to environmental damage from sand, ice, humidity and heat. Air Covers have developed products to protect against these hazards which would otherwise reduce operational time in the air. 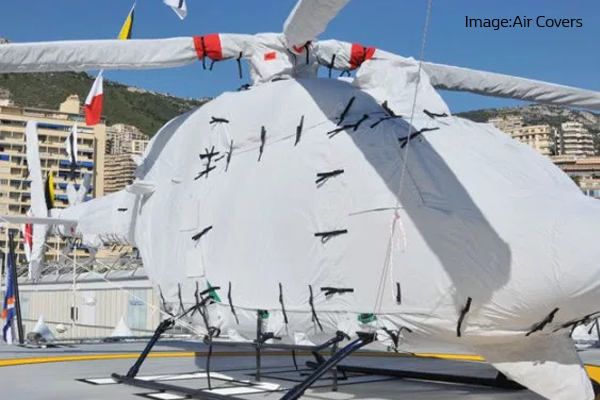 The covers also reduce the need for maintenance, which over the lifetime of an aircraft can easily be three times the purchase price of the original helicopter. The company has developed specialised breathable fabrics that allow heat to escape but are impermeable. They need to be quick and easy to fit, because of the harsh conditions in most of the markets Air Covers operate. For example in Saudi Arabia cockpit temperatures can reach 81C after just 120 minutes without protection, while with the cover the cockpit temperature is just 43C. Advanced computer aided design facilities are used for every order enabling millimetre precise measurements to be taken. “The move to Wales was a key moment in the growth of Air Covers. Since 2006 we have become a global leader in our chosen niche – environmental protection for high value equipment. Our productivity, product range, quality and skills grew exponentially with investments in skills training and capital equipment. “Our laser scanning and 3D modelling department had the space to grow and we partnered with local businesses for product testing. Within 18 months we had been approved by Airbus Helicopters and Bell Helicopters USA and diversified into marine and land equipment protection. The company hope to start a close co-operation with nearby Wrexham Berwyn Prison where inmates will be given NVQ training in the manufacture of an Air Cover subsidiary, Klobbabags.